Freedom! Or rather, not being housebound. Much was made at NCT class about the importance of mothers not becoming isolated in the early days after their husband has returned to work after paternity leave. Great! 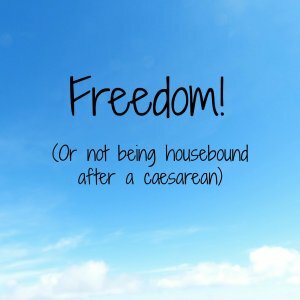 I thought, I’ll go for lovely walks with the baby after she’s born; I’ll pop into the city and meet other mummy friends for coffee and cake and have a lovely time; I’ll go to various mother and baby groups to foster my child’s social, emotional and cognitive development whilst chatting to the other mums for a bit of emotional well-being myself. They didn’t mention that when you have a caesarean the physio will scare you witless by telling you about a lady who ‘went for a thirty minute walk three weeks post section and did herself some serious damage’ and that you’re not supposed to drive for up to six weeks, depending on your recovery (apparently some women feel fine to drive after four, though; fortunately my insurance company are great and their policy says you can drive when you feel ready and can safely do an emergency stop – it’s worth checking with your insurance company though as apparently some require a letter from your GP to say you have recovered sufficiently to drive). So I’m now four weeks postpartum and I’ve only been to one mother and baby group (with my husband, while he was still on paternity leave) and one yummy mummy meet up (which a pregnant friend who had already put her isofix base in her car agreed to take me to). The yummy mummy meet up was lovely and my first proper trip out without hubby; we went to a trendy café in a local park and I enjoyed some scrumptious poached eggs and bacon on gluten free toast (That’s the good thing about trendy, it means they are more likely to cater to my dietary needs). It was soooo good to have runny yolk for the first time in nearly a year. Yum! Hopefully next time we meet I’ll be able to have a good walk around the park too with Little M.
This weekend I decided to give driving a go again, while I had hubby with me to take over if necessary. To be honest, I don’t know what I was worried about. I was totally fine driving and haven’t experienced any after-effects. I’m hoping this will make a huge difference to me as most of the mother-baby groups are in a small town a 10-minute drive away from where we live – not on a direct bus route and certainly not walking distance away. So I’m hoping to be able to be a bit more sociable this week. "Meet the Parents – Advice for New Mummies and Daddies with Dear Bear and Beany"
I know what you mean, the first couple of weeks were tough as I had quite a lot of pain but the last week or so I’ve felt pretty good. I suppose they scare you as it would be so easy to overdo it lifting car seats etc, which I’m still going to be careful about for a couple more weeks (but I am a weakling anyway!). Yep, I didn’t leave the house for first fortnight! Need to make sure I don’t get too carried away just yet as I don’t want to set myself back. I’m glad you recovered well! Thanks. She’s normally asleep before we’ve got to the end of the road! Thank you. 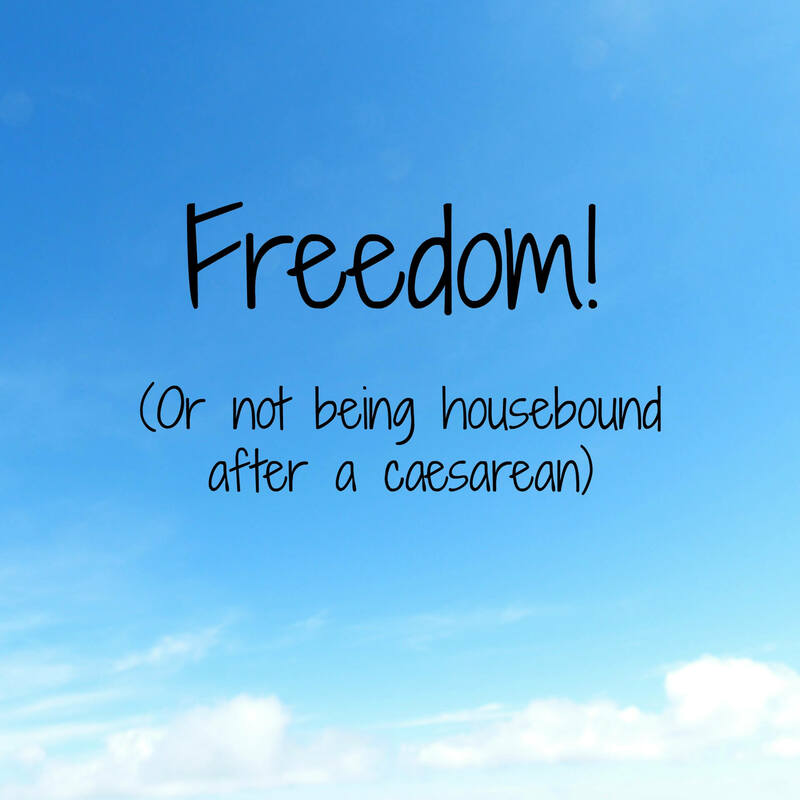 Yes I have been very jealous of all of the mums who didn’t have a caesarean and have been gadding about! Pleased to be able to join them! Glad you are feeling a bit better and can get out and see people. I remember the first few weeks not going anywhere and feeling sore and tired. You just have to listen to your body and not overdo it – I had a couple of days where I had twinges after overdoing it a little and then rested up for a couple of days. One of my friends did manage to do a bit of damage when she walked too far carrying her baby…..eek!